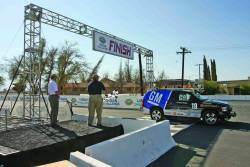 Carnegie Mellon University and Stanford University reversed the order of their finishes in the 2005 DARPA Grand Challenge, snaring first and second place, respectively, in the Urban Challenge finals held November 3 in Victorville, California. Both entries incorporated POS LV (Position and Orientation Systems for Land Vehicles) integrated GPS/inertial systems from Applanix Corporation, of Richmond Hill, Ontario, Canada. “Boss,” the entry from the Tartan Racing racing team from Carnegie Mellon’s robotics institute in Pittsburg, Pennsylvania, turned in the top performance in the Defense Advanced Research Projects Agency (DARPA) Urban Challenge and won the $2 million cash prize. Stanford Racing’s “Junior” of Stanford, Calif., won the $1 million second place prize, and “Odin, the entry of the Victor Tango team from Virginia Technical Institute (VTI) of Blacksburg, Virginia, received $500,000 for finishing third. In 2005, a Stanford vehicle, “Stanley,” grabbed the first place position in the 131-mile Grand Challenge when the leading Carnegie Mellon vehicle developed engine trouble in the final miles of the desert race. Vehicles that competed in the Urban Challenge were required to operate entirely autonomously, without human intervention, as they obeyed California traffic laws and performed maneuvers such as merging into moving traffic, navigating traffic circles and avoiding obstacles. The vehicles had to perform as though guided by human drivers and continually make split-second decisions to avoid moving vehicles, merge into traffic, and safely pass through intersections. VTI’s system on-board Odin incorporated a ProPak-LBplus GPS receiver from NovAtel, Inc., of Calary, Alberta, Canada. 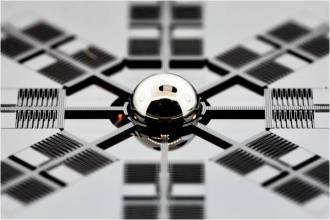 The NovAtel product had also provided guidance and positioning to Stanford’s winning entry in 2005. All three entries also used satellite-based real-time differential GPS service provided by OmniSTAR. The Urban Challenge prize winners competed as part of a field of 11 finalists selected from 35 semifinalists that competed in the National Qualification Event (NQE) prior to the final event. Semifinalists were selected from the original field of 89 competitors. The NQE and the main event took place October 26 to November 3 at the former George Air Force Base in Victorville, which is used by the U.S. military to train for urban operations. The network of roads on the site effectively simulated the type of terrain American forces operate in when deployed overseas.